I really can’t improve upon what the Suzuki Service Manual explains as, how to perform a valve check, and valve adjustment on the DL-650. However, my situation is a little different then the average DL-650 owner. That’s because I don’t have any fairings on my bike anymore. If I want to check my valves, I just drop the radiator, remove the fuel tank, and I am ready to go. But, I had to gather up quite a bit of confidence to get myself to the point of, removing the front and rear cylinder covers! 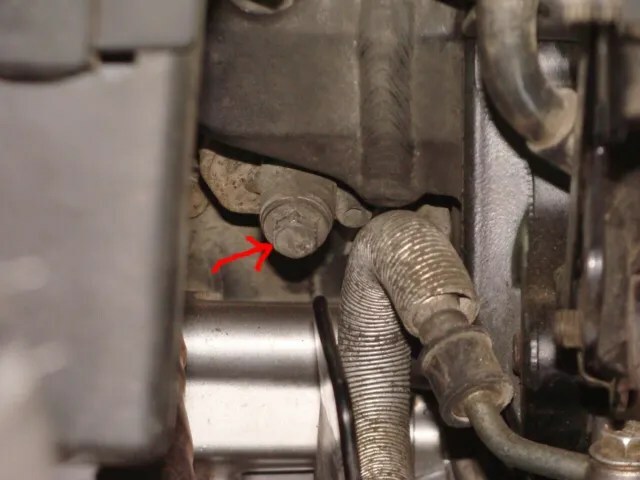 I had never done a job as technical as this before, and admittedly, I was fearful of what problems I would encounter, and also what possible damage that I might do to my motorcycle’s motor. In contemplating doing this work, had to inventory the tools that I had on hand, and I purchased a few others to ensure that the project went smoothly. For the brunt of the work, I used a simple set of mechanic wrenches, and a 3/8″ drive, “hobbyist”, metric socket set, (They are “Husky” brand. I bought them at Home Depot.). 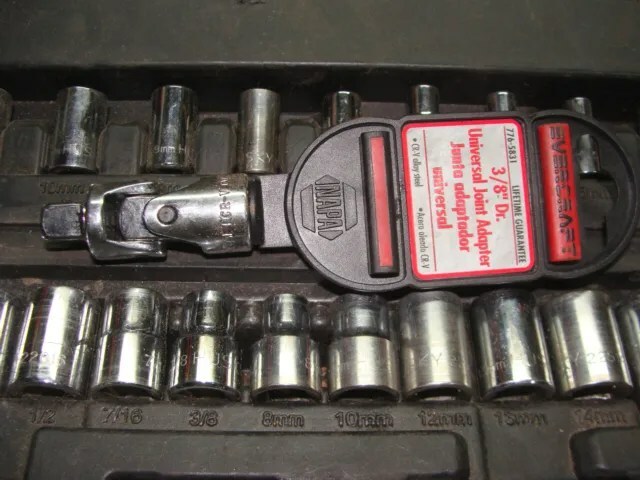 Additional tools that were beneficial to have on hand, were a metric set of Allen/socket wrenches, a 3/8″ drive torque wrench, a set of feeler gauges, a 3/8″ drive “universal joint adaptor”…..
……a micrometer, or something like this device that I purchased at Home Depot for about $36. It worked surprisingly well!!! First, I removed the spark plugs, the PAIR valves and the three allen bolts that hold the cylinder covers to the motor. I was careful when I gently removed the rubber gasket that sits between the cylinder cover, and the motor. Of course, the Service Manual is going to recommend that, “Always use new gaskets when reinstalling the cylinder covers”. My cylinder covers have been removed three times, and I am still using the original gaskets; no leaks! (I WILL replace the gaskets during my next valve check.). Here is the rear cylinder/cam journal area exposed. Back in 2008, I started to do the first valve check myself. When I determined that the valves did indeed need to be adjusted, I got scared because it was more work then I felt capable of doing. I had never done work like a valve adjustment before, and I didn’t have anyone close by to show me how to do it. I ended up taking the bike to my local dealer and had them finish the job for me. I asked the technician to please fill out the spaces for me so that I could keep a record of what work he had done. Below is what the chart looked like after it was filled out. 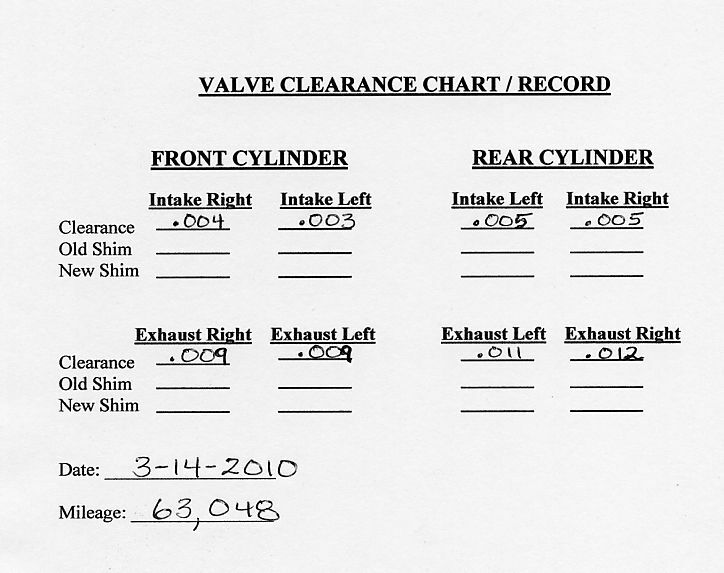 At 63,000, (40,000 miles since the last valve check…. ), I decided to give a valve check/adjustment a go by myself. Using the instructions in the “Periodic Maintenance” section of the Suzuki Service Manual, (Pages 2-8 thru 2-12 in my manual), I set the front cylinder to, “Top Dead Center”. I made sure that the “F” was lined up properly on the generator rotor…. ….and that the cam “lobes” were pointing according to the diagram on page 2 – 8 of the manual. 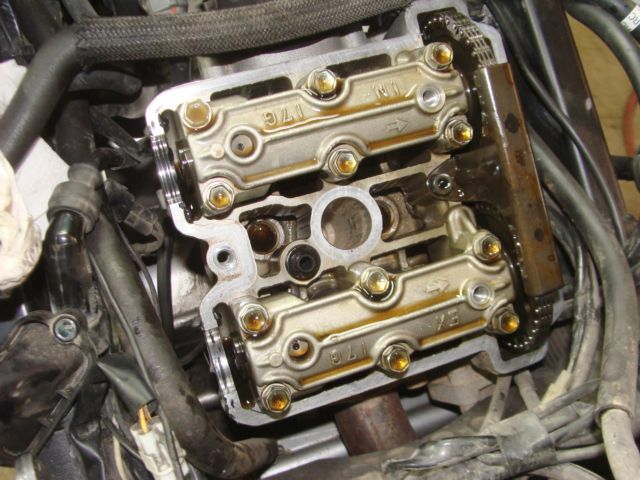 The specified valve clearances for the intake valves are: [B]0.004 – 0.008 [/B]inches. The specified valve clearances for the exhaust valves are: [B]0.008 – 0.012[/B] inches. 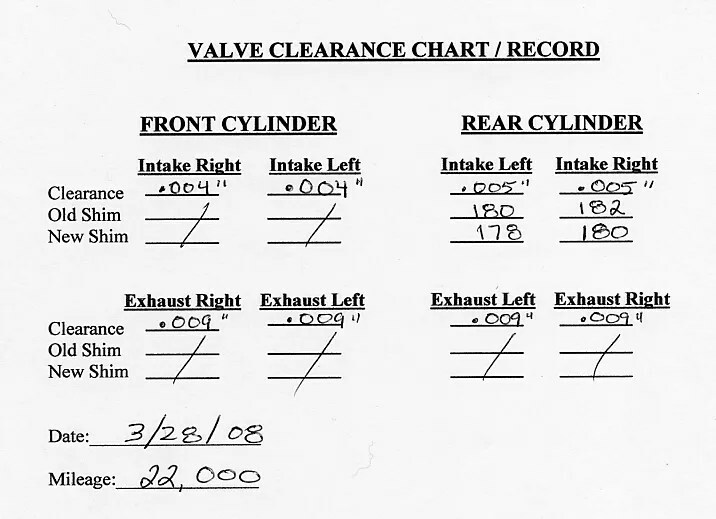 I measured the four valve clearances on the front cylinder and then I rotated the motor, (Using a 17mm socket on the generator rotor nut), to get the rear cylinder to TDC as per the diagram of the lobe positions in the Service Manual, [page 2 – 8], and measured the rear cylinder valve clearances. The front cylinder intake valves were too tight and the rear exhaust valves were too loose. I would like to share some thoughts about the experience I had in using the feeler gauges to check the valve clearances. 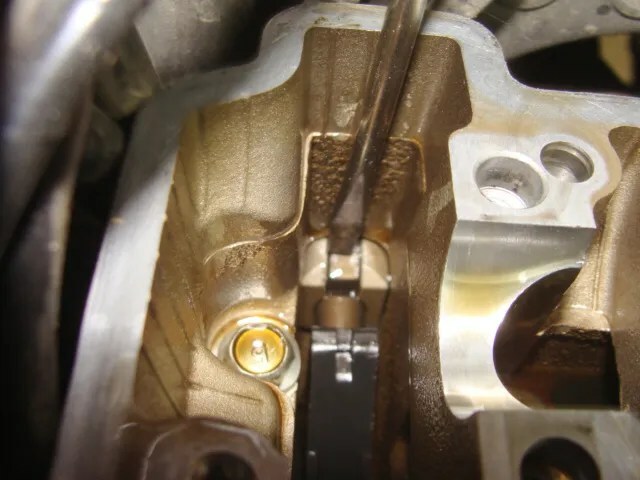 1 – When using my feeler gauges to measure the valve clearances, I found it easiest to slide the feeler gauge, underneath the cam lobe, by working from the center of the cylinder, pushing “out” towards the edge of the motor case. 2 – It does take some “pressure” to push the feeler gauge underneath the cam lobe. 3 – Because the intake tolerances are so small, the feeler gauge for the intakes is quite thin; it can bend easily under the pressure necessary to slide it into position. I had to go slowly and smoothly. 4 – If you look carefully at my chart, you will see that the spaces, to be filled out, for the valves are in different locations for each cylinder. Here is why: To me, the left side of the bike is the “left side” as you face forward. The same is true for the right side. However, when working on the front cylinder, I was sitting on the floor, (I don’t have a lift……..), facing “aft”; looking at the front cylinder. 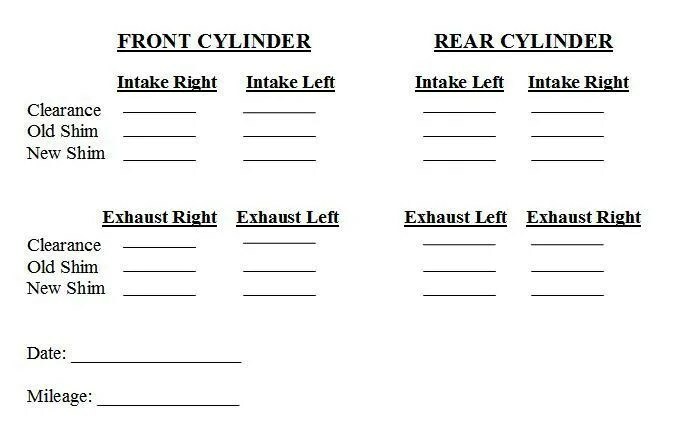 I decided to set up my chart with the locations of the left and right, “intake” and “exhaust” valve measurements as exactly as I am looking at the cylinder and the paper chart. This is why the front cylinder and rear cylinder labels are in the positions that they are. They are set up on paper exactly the same way as how I look at the actual cylinder. I needed to loosen up, (use a thinner shim), on the front intake valves and I needed to tighten up, (use a thicker shim), on the rear exhaust valves. I decided to start with the front cylinder because there is so much room to work around, (which eased my mind because I was scaring the crap out of myself because I have never done work like this before!). I removed the three bolts that fasten down cam chain guide. Other then the actual journal cover, there is nothing else to remove, to get the cam shaft out. Because I was nervous as all get out at doing what I was doing, I kept photographs to a minimum on the front cylinder while doing the work there so that I could maintain “focus”. However, the following photographs illustrate how I released the tension on the cam chain so that I could remove the cam shaft. These photographs areALLfrom the rear cylinder. They are applicable to the front cylinder. First, I would like to explain something. 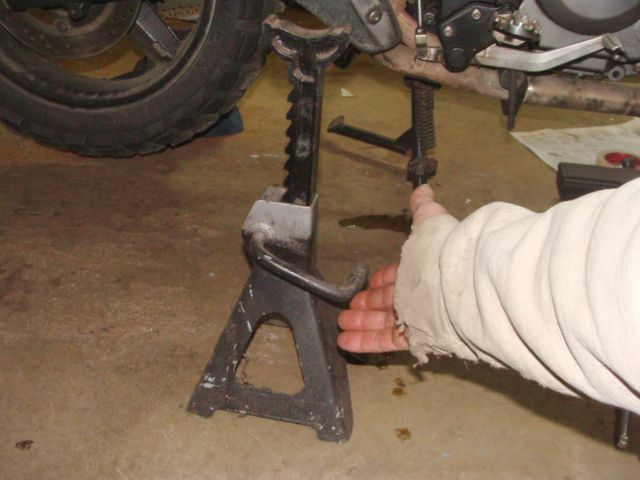 The cam chain tensioner works much like a jackstand. 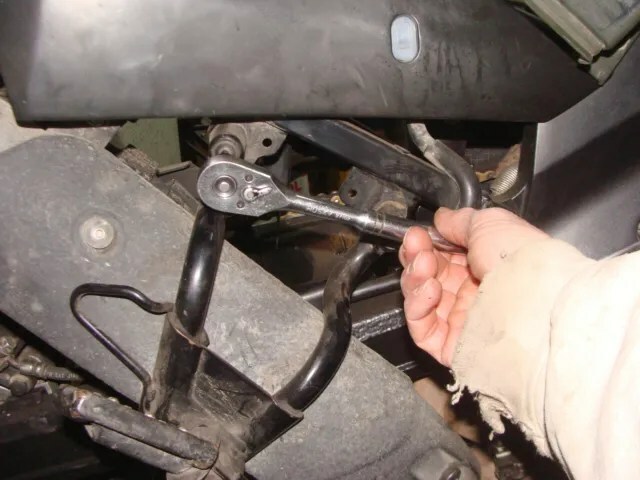 The only difference is, the jackstand isn’t “spring-loaded”, but the cam chain tensioner is. There are “notches” and “pawls” involved in both. If I lift up on the handle, the “pawl” disengages from the “notches” and gravity causes the stand to drop down, (and taking a chunk of skin off of a finger if you aren’t careful!!!). To get a cam shaft out, I needed to release the “pawl” from the “notches” in the motor case. Looking down inside, near the cam sprocket, that is closest to where I removed the cam tensioner bolt, I was just able to make out the “pawl” that I was looking for. This is what the pawl looks like, with the cam shaft removed, and a screwdriver in the proper position, to be able to release the tension of the pawl, from the notches in the side of the motor case. With one hand, I slid a long, slotted screwdriver down to the pawl. With your other hand, I pulled upward on the cam chain giving it some firm tension. Like the photo below. With one hand applying tension to the cam chain, (pulling upward), I pressed downward with the screwdriver on the part of the pawl that is closest to the motor case. I now had enough slack…. 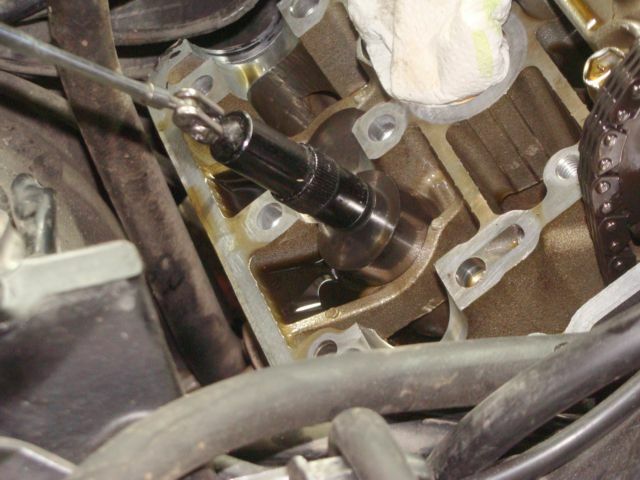 ….. and to slide the camshaft out of the journals. I slid a screwdriver through the cam chain, and across the subframe, so that the cam chain wouldn’t slide back down into the case. To remove the “bucket” from the tappet sleeve, I used a “magnetic wand” and withdrew the bucket. Underneath the bucket, is where the shim is located. And, here is what a shim looks like removed from the bucket. This is why this system is called, “Shim Under Bucket”, style valve adjustment. I am not going to bore you with how many trips I made to my local dealership to obtain, (they swapped shims with me), the proper sized shims I needed. I can tell you that the chart in the Service Manual is to be used as a guide only!!! 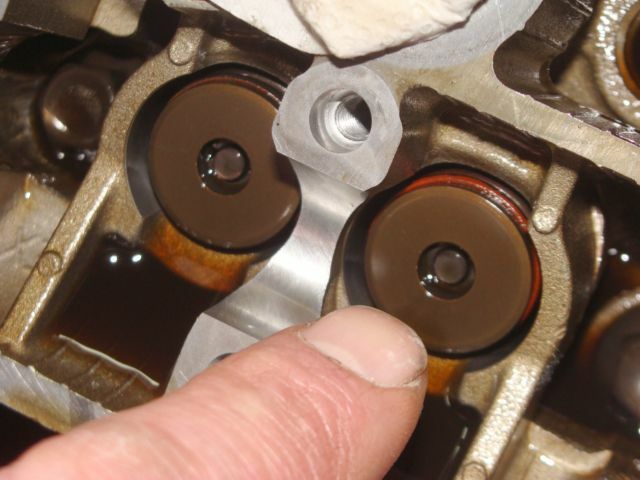 An example of this is, my original front intake valve shims were labled, “175”, (or 1.75mm thick). Using my measurements of .004 and .003, the chart suggested that I needed 165 shims. I made the trip to my dealership to swap my 175 shims for new 165 shims and came back home and installed them…… Only to find that the 165 shims put me right at the other end of the recommended specification! I made a trip back to the dealership to pick up 170 shims. I installed them and they put me right at a .006″ clearance; perfect. 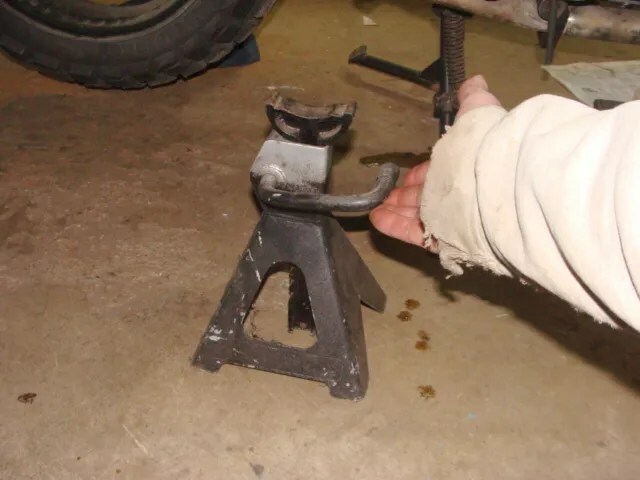 Here is a sidebar note about something I learned: When selecting shims, from whatever source, MEASURE them to make sure they are the right thickness that you need. 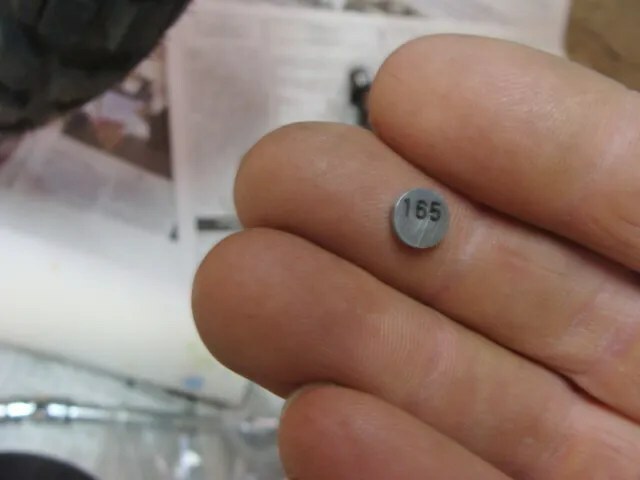 Swapped shims often have the printed numbers worn off of their faces. Don’t take it for granted that shims coming out of the “170” section of the shim box are actually “170” shims! That’s where the digital calipers came in handy. I took them with me to my dealership to ensure I was picking up the right shims. When I installed the new shims, I gave them a light coat of oil and set them in the matching sized “divot” in the head of the tappet. Here is a shim installed into its proper place with the Service Manual recommended, “numbers faced down”, position. Sliding the bucket back over the shim. 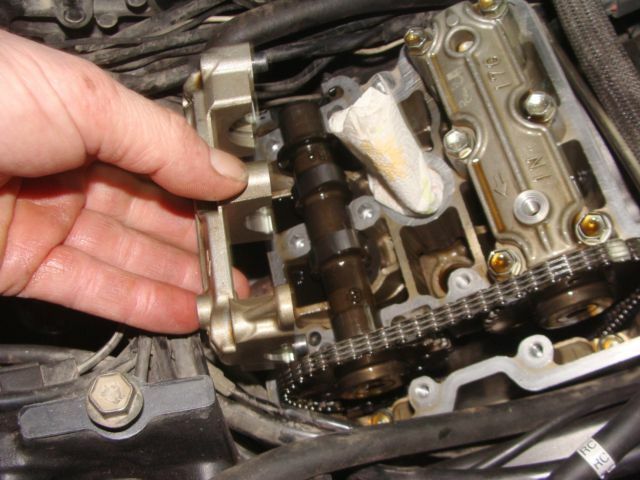 I reinstalled the cam shaft, as per the alignment instructions on page 3-100 of the Suzuki Service Manual. 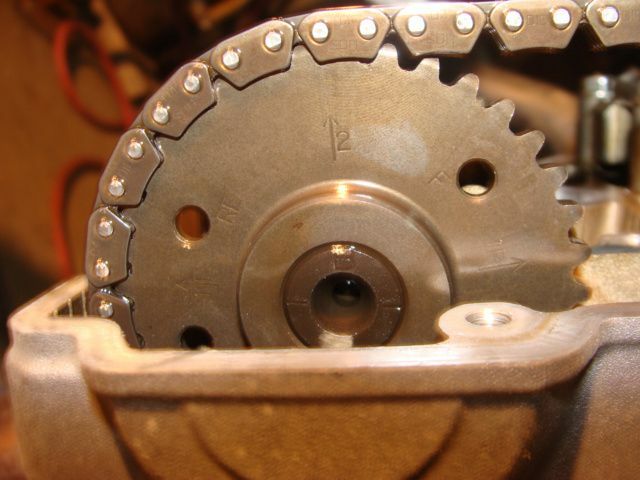 Here is what the markings of the cam sprockets looked like for the front cylinder. I took plenty of time with this! The diagram that is on page 3-100, of the Service Manual, has to be followed to a “T”. I discovered, when installing the cam shafts and the cam chain is not aligning correctly with the cam sprocket teeth, something is wrong. I was smart about this, and did not turn the motor! When the cams were installed correctly, I installed the journal cover, and torqued the bolts to 7ft lbs. Then, I rotated the motor a couple of times to set the shim and squeeze out excess oil, then set the motor back up to TDC, and I checked my measurements again. When the measurements were good, I moved to the rear cylinder. 1- Work on the front cylinder first. 2- Follow the photographs above, (even though they are from the Rear Cylinder), to make your valve adjustment. 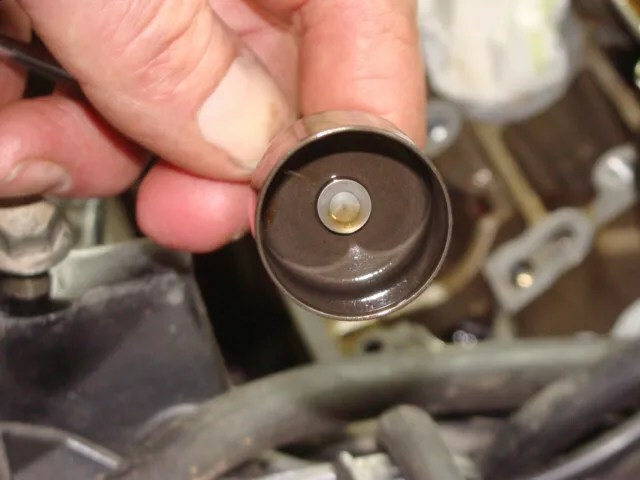 3- When the valve adjustment is complete, LEAVE THE CYLINDER COVER OFF. You will need to see the front cylinder cam shaft lobes for reference in regards to the Rear Cylinder. The front cylinder measurement is taken at TDC. The realignment of the front cylinder cam sprockets, (using the markings on the cam sprockets in conjunction with the Service Manual diagram), is ALSO done at TDC. The rear cylinder isn’t done that way…… That was how I made my mistake. I completed the front cylinder job fairly quickly. I figured that I would blow through the rear cylinder and go for a ride. I spun the motor so the rear cylinder was at TDC, just like the front cylinder. I quadruple checked my measurements on the rear exhaust valves, then released the pawl on the cam tensioner, removed the journal cover, removed the cam shaft, withdrew the buckets, pulled the old shims, measured them, made a trip to my dealer to swap for new shims……..
…..installed the new shims, installed the buckets, installed the cam shafts…….. Guess what, the rear cylinder cam shafts are not installed at TDC like the front cylinder cam shafts are installed! I returned to the Service Manual, (Page 3-103), and studied the diagram on that page. I discovered that, the lobes of the rear cam shafts are NOT installed with them set at TDC. 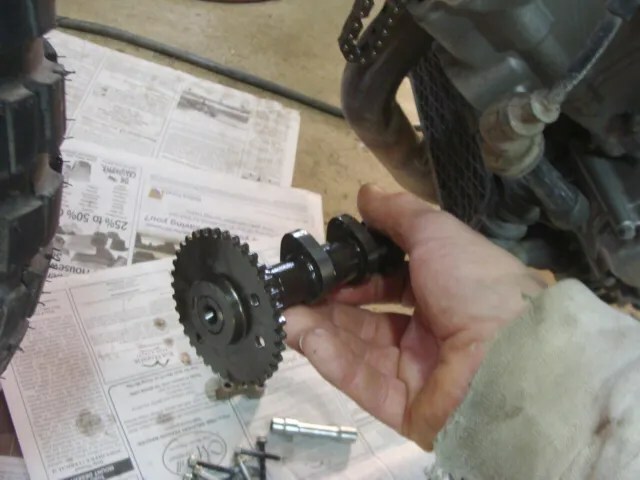 The rear valve clearances are measured at TDC, but I had to rotate the motor so that the cam sprocket markings were aligned for installation, (like the diagram on page 3-103 of the Service Manual), before I removed them. So, (This is the, “Important Step”), the front cylinder valves are measured and adjusted at TDC. The rear cylinder valves are measured at TDC but adjusted at, (I haven’t a friggin’ clue), just use the diagram on page 3-103. I got out of my mess by studying the diagrams in the Service Manual, (Pages 3-100, 3-103, and 3-105), and by looking at the positions of the lobes of the front cylinder, (that’s why you shouldn’t install the cylinder cover. You may need to see the cam lobe positions for reference. ), and by carefully spinning the motor until I could tell that the rear cams were back in sync with each other and with the front cams. 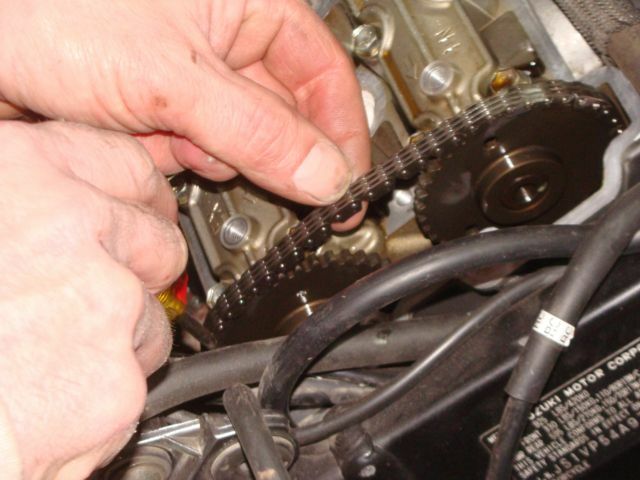 I could not find a torque specification for the cam chain guide in the Service Manual. However, there is a “torque guide” on page 9 – 43 in the manual. 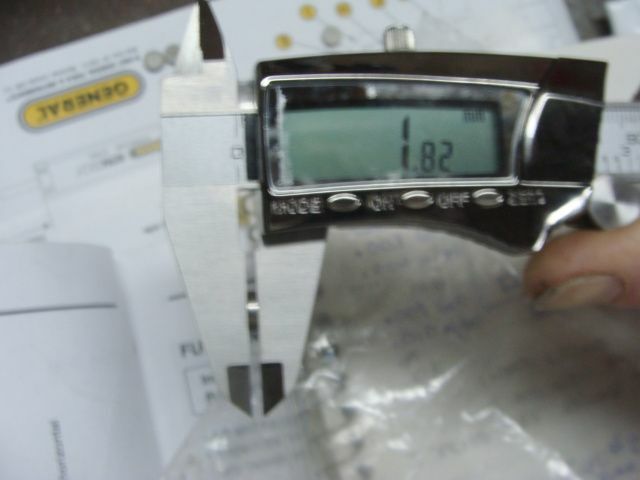 I measured the diameter of one of the chain guide bolts; 5.86mm, using my digital calipers. I rounded that size up to 6mm and, using the chart, that led me to a torque specification of 7ft lbs for the cam chain guide bolts. That is also the same torque specification for the journal cover bolts. I felt okay about that. Here was my method of getting to the, “all-hard-to-get-at” the rear cylinder, cam tensioner bolt for removal. 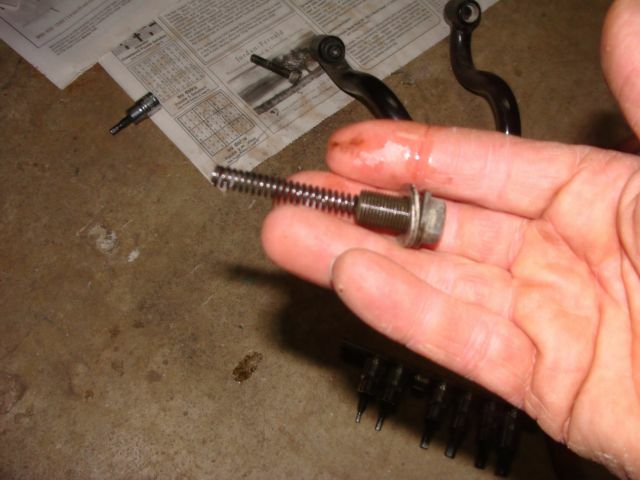 Here is the head of the tensioner bolt as seen by sighting down the right side of my motorcycle’s swingarm. I did not remove my exhaust. I did not remove my rear tire. The dealership never installed the plastic “mud flap” that some of you riders have installed on the swingarm. I do not have anABSbike. ….remove the right rear passenger footrest bracket…..
…then I reached in with my 6″ long ratchet extension, equipped with the 3/8″ universal adaptor…. 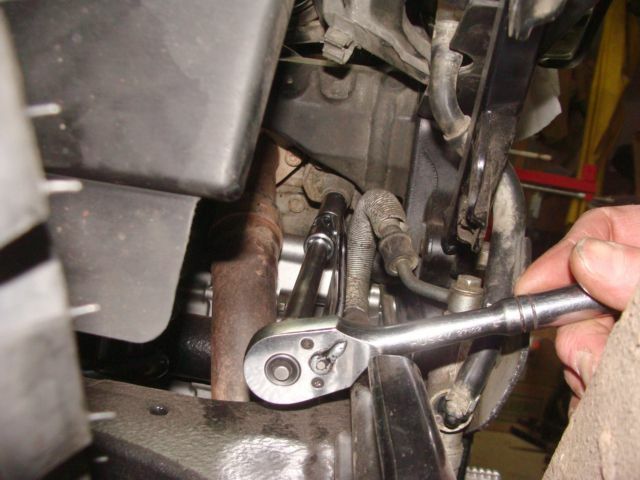 ….and easily removed the tensioner bolt. It is now late Winter 2012. I need to do this job again; to check the valve clearances before I start another season. If I learn anything new and exciting, I will update this post with that information! Excellent write up Barry. I remember getting up the nerve to do my first valve check. Lots of reading on the internet and shop manuals gave me the information and courage I needed. Like you I have found out that it is not that difficult of a task. I am sure write ups like yours will help encourage other new comer shade tree mechanics to do their own valve checks. Hey, BL! I’m working through my first Wee valve check, and your write up is terrific. Given that my K7 is at its 4th BD (or so) I noticed that Suzuki wants me to change a bunch of hoses. 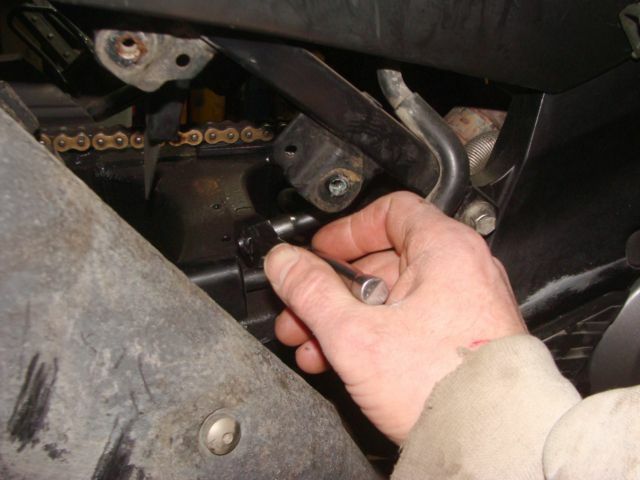 As one of the hardest riding Stromers that I know of, have you had to replace radiator or fuel line hoses? Seems a bit extreme for caution’s sake. I agree with your assessment. But, take the time to do a thorough check of your hoses. Inspect for possible deterioration, and also take the time to tighten up hose clamps too. At nearly 100,000 miles, I still have all of my OEM hoses on my K7. However, I have not made my “spring checkup” yet. I sit here pondering which shim to put into an intake valve. If valve clearances tend to get tighter, is it better to shoot for the wider side of the prescribed range or be slightly on the tighter side? With a .11mm gap on an intake and a 1.80 shim currently installed, I have the choice of using a 1.78 (oem that I’ve kept) or 1.75. My gut says to go with the 1.75 and be good for a longer period or riding. Whadayathink? I feel that shims sizes are a lot like riding on gravel: Stay Loose! 1. I was able to access the rear cylinder valve tension control bolt from below using two ratchet extensions with a universal knuckle at the top. I started from the right/center dog bone area and angled the extensions at about 45 degrees. Not a lot of bend in the knuckle, so I think the torque setting should be pretty close. I didn’t have to remove or loosen anything to do this. 2. 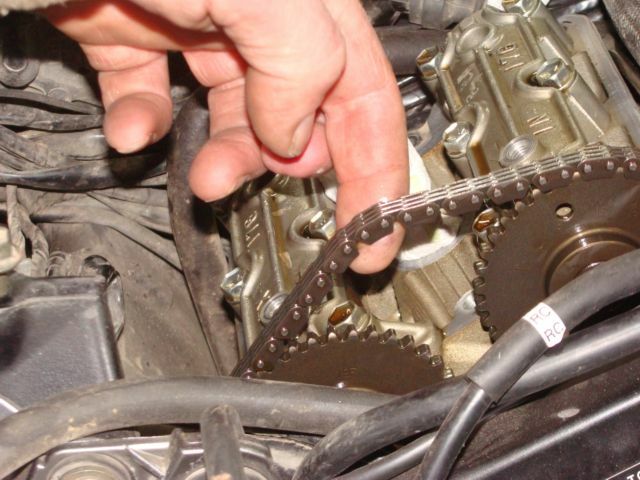 The drawings in the service manual and the pictures that I’ve seen all show 8 full timing chain links when counting the 16 pins between the “2” on the exhaust and the “3” on the intake cam sprockets. Both my front and my rear cylinders were different, however. While the markings are 16 pins apart, pin “1” is on a different link than pin “2”. This caused me hours of checking and re-checking, and then checking and re-checking again on the front. I paid extra-close attention when I opened the rear cover and saw that it, too, was set the same. Believe me, my story and the photographs only tell a part of the “head scratching” I did, and like you, the time spent checking…..rechecking……checking again. But, it’s okay. Those that do the work, are not paying the labor costs; they are gaining an education. My bike started; I passed the class! Well, after finishing the 15k servicing and adding driving lights and highway pegs, the Wee fired right up without a hesitation. Excellent, Bob! Congratulations on getting all of the work done, and your additions too. Let the 2012 season begin! Barry! Thanks for putting together this informative and entertaining site. I’m building steam to do my 14.5K service, and checking and adjusting the valves is the only thing that makes me a little bit nervous… With this site and the service manual though, I should be good to go. The pictures help! Maybe I’ll see you around Exeter NH sometime, or up your neck of the woods this summer. Thanks for this great site Barry. My front exhaust valves are tight, so I’ll be reading up and smokin on it to build the courage to tackle it this week. Since I’m also installing Ricor fork valves, I think I’ll pull off my forks to give me some extra room. I noticed that you did not make a reference mark the cam sprocket and chain, for reassembly. On hindsight, do you think that would have helped making sure the alignment was right? Absolutely! A reference mark would have been very helpful when I did this job. It was my first time doing something like this, so I learned a lot. Some of the lessons learned came to me in hindsight! Thanks for taking the time to post all this info Barry. I plan to tackle my second check by myself in a few weeks and your write up has been the most informative (and encouraging), although I do need to pick up a copy of the manual. I’ll let you know how it goes. Barry, I have read the service manual (repeatedly) and numerous other online posts on Stromtrooper and VStrom.info and yours is BY FAR the clearest and most helpful of the bunch. 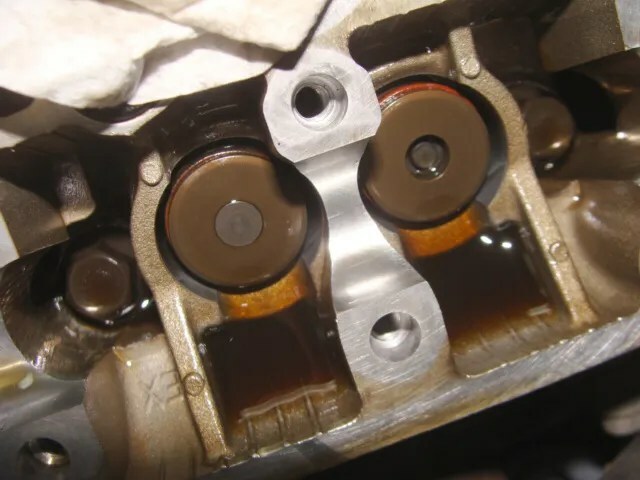 I had given up on doing the adjustment needed (I have one valve out of spec at 32,000 miles) because I could not get comfortable that I could do it correctly! Now, after reading your excellent write up, I am going to tackle it myself! Thanks a million for doing such a great job of documenting the process! Just finished my check and all are within tolerance at 30,000 miles. The PO put a diagram with the results of the 15k check in the owners manual (thanks, PO) and the clearances had not changed. 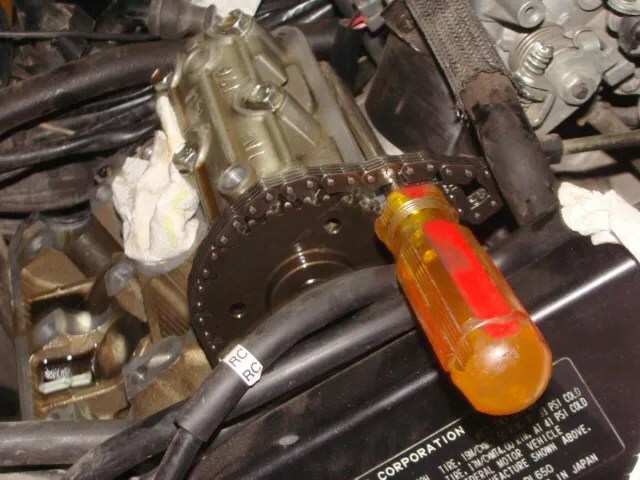 BUT two things I think are missing from help files: one, the radiator removal is never detailed and thus the fact that there are two little clips on the plastic piece that release it and all the wires attached to it and 2), the timing mark for the rear cylinder is marked ‘R’ on the flywheel. I saw the R mark while doing the front but I’ve seen various marks on flywheels before that had nothing to do with TDC so I desregarded it until F wouldn’t put the cams in the right position. Just saying. Otherwise, great help and once the radiator was out, a quick job. Thanks! 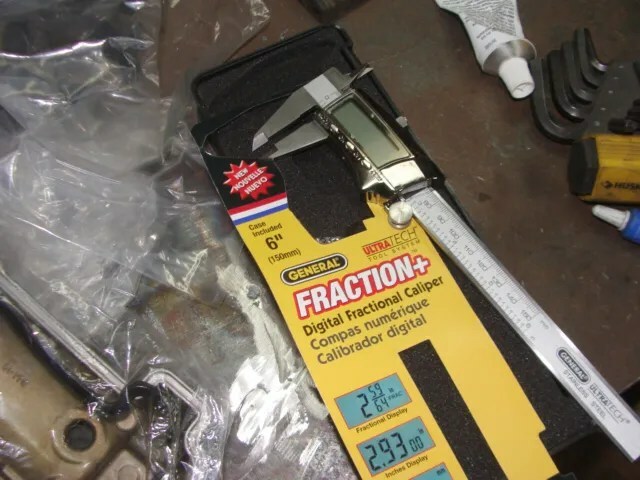 I would like to suggest that after checking the clearance and if you have to remove the cams, write down the original shim size then leave the shims out after measuring them. 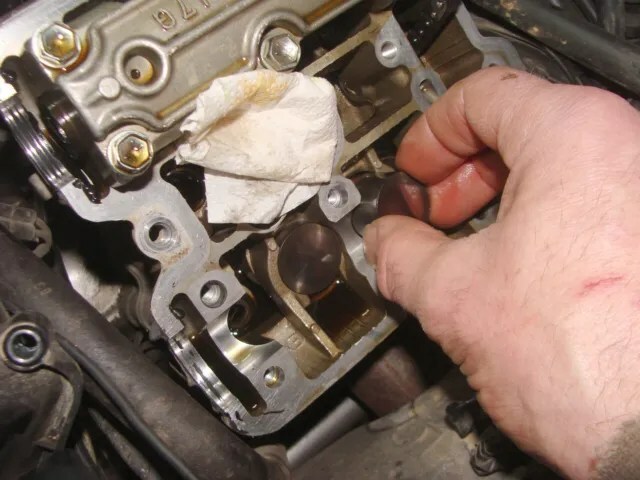 This allows you to re-use the shims in the other cylinder if you can. For my check all of the valves were off. I sized the front cylinder first then replaced everything and went to the back. I found that I could have used the shims from the front in the back cylinder but I left the rear cylinder. So now it will be double the work. Barry! thanks first of all for the time that you have put it to you right up to keep us right in in the proses of valve clearance. Am going to give it a go THANKS AGAIN. I’m in the process of replacing shims on my ’07 at 22,000 miles. It’s my understanding both cylinders’ cams are set with the generator mark at F using the marks on the sprockets per the manual, but the rear cylinder is not at TDC as some would assume. The R generator mark is where the rear cylinder is at TDC because the rear cylinder ignites 270 degrees after the front cylinder, not 360 degrees. I can’t find any info to confirm this, can you? First I have to let you know that, I no longer ride my V-Strom. I gave the motorcycle away, along with all related tools and the Service Manual. I have nothing to refer back to other than what I have written in my post about Valve Adjustments! That said, I experienced EXACTLY the same issue that you have! And, I write about it in my post. Set the engine up as per the illustration on page 3-103 in the Service Manual. Take a look at the lobes of the cam. STUDY the illustrations on pages 3-100, 3-103, and 3-105. After completely rebuilding a 1993 KLR 650, that is what I am riding now! Sorry that I can’t be more help to you! I’ll join the ranks of people thanking you for such a well-documented description of the work. Between this and the manual, I found it to be very straight-forward and got mine adjusted correctly. I made sure my camshafts were in the right place by taking pictures of the shaft markings first so I could get them put back in looking exactly the same. Hooray for nice cellphone cameras! 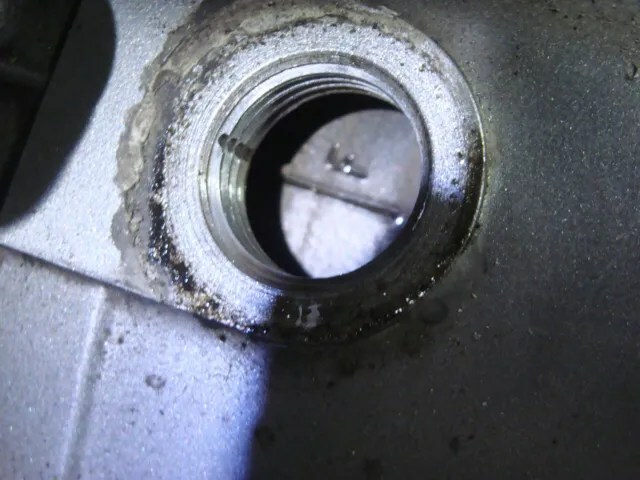 The only dark cloud is that when putting the cover on the rear cylinder I stripped out one of the cover bolts where it attaches to the camshaft journal holder. I’m going to try and repair it with a helicoil. If that doesn’t work, I will replace the holder. There’s a thread on Stromtrooper where several guys talk about how easy it is to strip these. Anyways, thanks again for your post – it really helped! Thanks for the clear description, it really helped! Did the first valve check last weekend (at 23.000Km), found six out of eight valves on the tight side of the tolerance. I adjusted those six valves to the middle of the tolerance. There were factory size shims in those six valves of size 172 and 162. Was a little of a puzzle at the dealer to get the correct shims for the correct middle tolerance. Although this all is technically not a difficult job, it does takes some time though, took me the Friday end the Saturday (limited daylight beginning of November). I did mark cam shafts and the cam chain with a permanent marker before removal for easy assembly after the valve adjustment, de-grease the marking spot first! I also replaces air filter and spark plugs (to Iridium ones). Had a drive today and the bike ran just as well as before, not really better though. Glad I did the job just before winter. I could not have done the valve adjustment without the information on this posting. The posting also gave me the courage to give it a try. My dl650 has 116k miles on it, and I thought “What the heck. 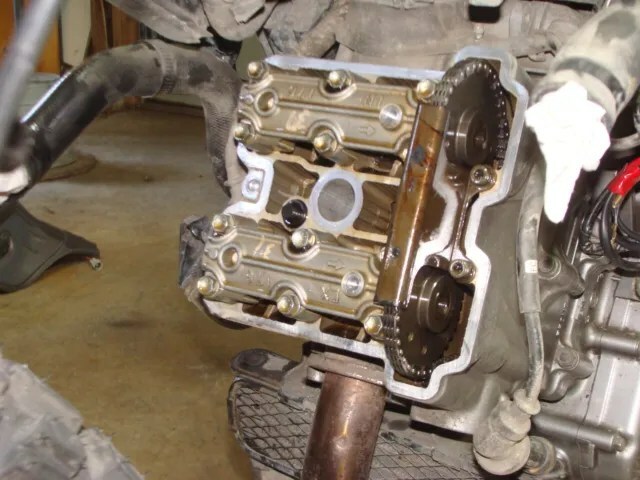 If I trash the engine then I will buy a used engine with way less miles on it.” Everything has pretty much been said on the blog, but I though I would just emphasize a few points so people like me, that do not get it the first time might catch on. 1.) Start at the front cylinder because both the measurement and adjustment are done at TOC. 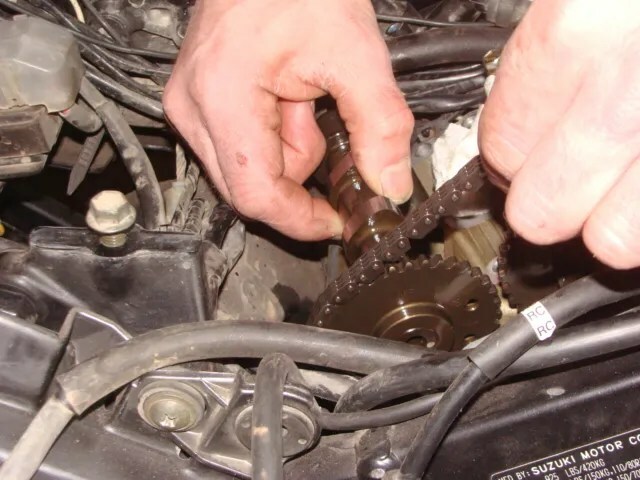 Do the rear cylinder second because you measure and adjust at different positions, and as Barry says you need to keep looking at the front cylinder to find out where you are on the crankshaft rotation. 2.) Just take out the main tension bolt. The service manual says the whole thing, but you do not need to. I got real good at taking out the bolts and freeing up the chain while learned by my mistakes. 3.) get a real good understanding as to where the cam lobes are supposed to point at all times. I had a temporary fiasco when I discovered half way through the process that the rear exhaust was not stock. Not sure what model or year it came from but the lobes were pointing 90 degrees the wrong way. Talk about scratching my head trying to figure out what the heck was wrong. 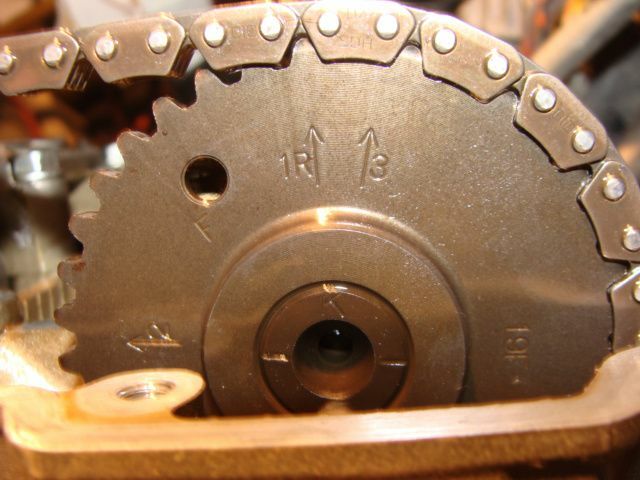 All of the marks on the sprocket were identical to the service manual, but the lobes were the wrong way. I could have eyeballed the sprocket adjustment, but I choose to purchase a used dl650 cam off of Ebay that worked out just great. No need to confuse me on the next adjustment, or someone else in the future. The moral of the story is just do not rely just on the sprocket marking, but check where your lobes actually hit. 4.) pull the slack out of the chain on the cam opposite from the tension bolt so your adjustment does not shift when you apply the tension bolt. 5.) Take a two step process and measure both the front and back cylinders using the “F” and “R” first, and then start over again and adjust the front and then adjust the rear by starting again at TOC and “F” for the front, then rotating 360 degrees for the rear. Overall, the process for the first time was really scary and time consuming, but i really enjoyed it. Especially when the engine sounds and performs much better than before. Great write up! Thanks so much. I’ve been putting this job off for too long and now I’m over 19,000 miles and ready to have a go. I can’t work on the bike at the apartment complex I live at so I have to beg time from a friend or schedule time in a DIY garage nearby. Provided I have all the parts and tools required (I’ve been reading and rereading the manual, the haynes guide, your post, and other posts on stormtrooper to make a list and check it twice) How long would you say this job would take for a patient and methodical newbie tackling it for the first time? Thank you for your compliment! As to how long it takes….the first time that I did it was when I took all of the photographs and notes to write up the article! So, it is hard to be a judge of this because of all of the added time it took me to document the procedure. What I would do is, just set aside a Saturday to do the work. It does not take a whole day!!! But being your first time, just figure on a whole day. You will be done faster than that, and that leaves Sunday for riding! Good luck!